Finding an accurate microstructural characterization of the peritumoral region is essential to distinguish between edema and infiltration, enabling the distinction between tumor types, and to improve tractography in this region. Characterization of healthy versus pathological tissue is a key concern when modeling tissue microstructure in the peritumoral area, which is muddled by the presence of free water (e.g., edema). Although diffusion MRI (dMRI) is being used to obtain the microstructural characterization of tissue, most methods are based on advanced dMRI acquisition schemes that are infeasible in the clinical environment, which predominantly uses diffusion tensor imaging (DTI), and are mostly for healthy tissue. In this paper, we propose a novel approach for microstructural characterization of peritumoral tissue, that involves multi-compartment modeling and a robust free water elimination (FWE) method to improve the estimation of free water in both healthy and pathological tissue. As FWE requires the fitting of two compartments, it is an ill-posed problem in DTI acquisitions. Solving this problem requires an optimization routine, which in turn relies on an initialization step for finding a solution, which we optimally choose to model the presence of edema and infiltration unlike existing schemes. 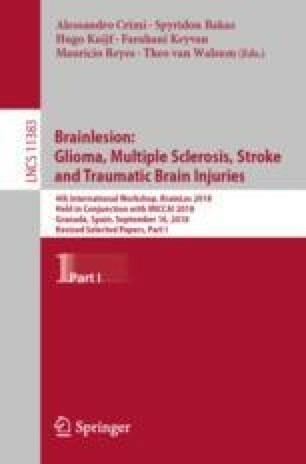 We have validated the method extensively on simulated data, and applied it to data from brain tumor patients to demonstrate the improvement in tractography in the peritumoral region, which is important for surgical planning.